The Oklahoma City Dodgers will host the team’s first Faith Night on Sunday, July 19, the team announced today. 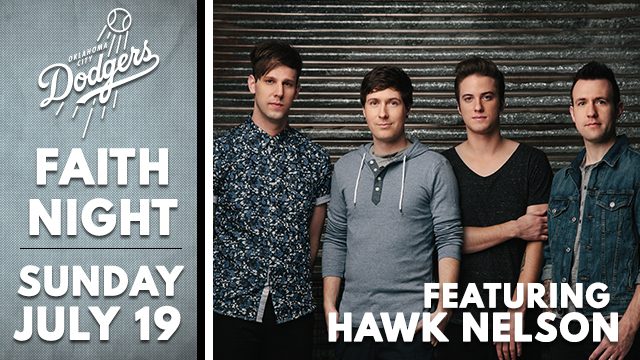 Popular Christian rock band Hawk Nelson will perform a pregame concert in the right field parking lot adjacent to Chickasaw Bricktown Ballpark from 4-5 p.m. Following the concert, the OKC Dodgers will take on the Round Rock Express at 6:05 p.m.
Tickets packages for groups of 10 or more are currently on sale and can be purchased by calling (405) 218-2100. For just $15, fans will receive tickets to both the Hawk Nelson concert and the OKC Dodgers game, as well as an OKC Dodgers hat. At this time individual ticket packages are not available, nor are tickets for the concert only. Since forming in 2003, Hawk Nelson has produced eight studio albums, with a ninth set to be released soon. The band has had 12 singles reach the top 20 on the contemporary hit radio charts, including three number-one hit songs. Their music has been featured by Major League Baseball, the National Football League, and NBC Sports. The Oklahoma City Dodgers start their season in less than one month on April 9 at Chickasaw Bricktown Ballpark. For more information about Faith Night or the upcoming 2015 Oklahoma City Dodgers season, visit okcdodgers.com or call (405) 218-1000. This article originally appeared on the official website of the Oklahoma City Dodgers . Click here to view the original story.